PAYMENT TAKEN AT CLASS, TEXT 4097825458 OR MESSAGE ON FACEBOOK WITH DATE AND TYPE OF CERTIFICATION YOU NEED. Additionally in the New year I am encouraging children to learn CPR, home safety & other emergency topics. If you have children ask about dates for kids. 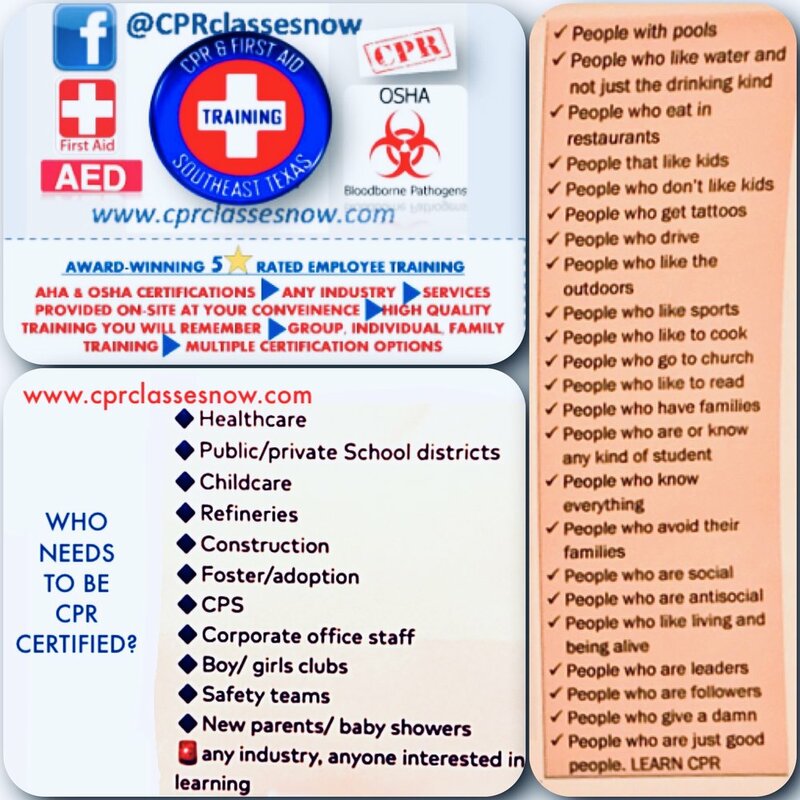 Don’t forget CPR training can be brought to you. On-site group classes available for 4 or more. Schedule for a time and date to best accommodate your workplace, event, family gathering or group. Please send a text to 409-782-5458 with the type of certification requested, name and date you are attending. Cash or cc accepted pay at class. Student handbooks are available online through American Heart Association or I have some to view during class. You may email or use form on home page for additional information or to schedule your workplace or group training. Private classes are available upon request. Thank you for choosing high quality cpr training and choosing to certify with CPR & First Aid Training Southeast Texas.